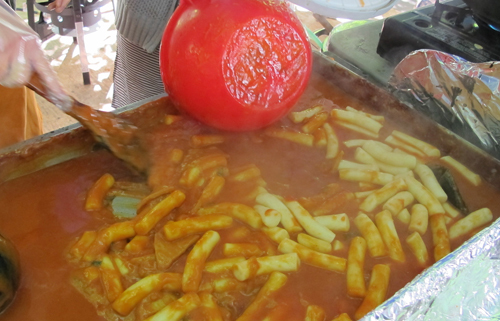 I went to the Korean Harvest festival recently, hungry for Korean food. I love its cold bean sprouts and its bulgogi and galbi meat dishes. I wanted to sample some other dishes for my next trip to a Korean restaurant. I made the mistake of eating dumplings first. I was consequently too full to try anything else on the spot. I checked out the vendors to see if something appetizing spoke to me. I gave the barbecued corn a pass. 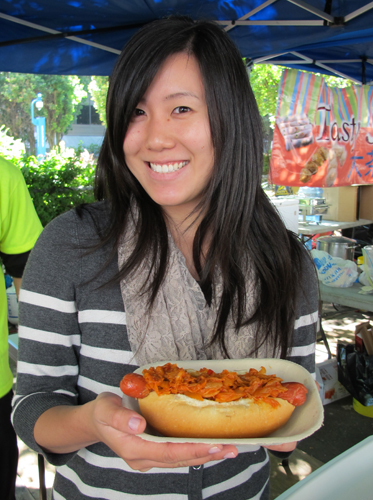 At the “Two Good Dogs” stall, Jennifer Nishiyasu was offering a sausage in a bun covered with a mix of wasabi, seaweed, bonito flakes and teriyaki sauce. Her “FAMOUS Hachiko” dog was Japanese! She also offered a similar “FAMOUS Tangy Thai Slaw” dog. They were best sellers at the Asian Night Market where “Two Good Dogs” sold them earlier this year, she said. But she had a Korean version called “Flaming Kimchi” dog. It was covered with spicy kimchi cabbage. Was this the latest thing in Korea? No, it was something her partners made up in Toronto! They were testing the market for it. It was a new dish. They had no restaurant but Jennifer promised to tell me about their next festival appearance. At “Tasty Sam,” I found fish balls simmering in a green curry sauce. The stall manager said the fish balls were Chinese but the manager was cooking up curry kimchi fish balls for the predominately Korean crowd, another fusion effort for the occasion. Kimchi is fermented cabbage and radish (daikon), traditionally highly spiced with red peppers, sugar, garlic and fish sauce. It is usually too hot for me but if served with curry, it might be okay, I thought. I said I would be back, but then I forgot. There were too many other interesting items. The next stall advertised Korean tacos, steak sandwiches and fries. Those didn’t sound Korean either though they looked appetizing. A stall labelled “Apkujung” did sound Korean. The menu was listed in Korean and English and included leak pancakes or boo choo jeon. I could see women cooking them, along with some meat. They looked delicious. I made a note. 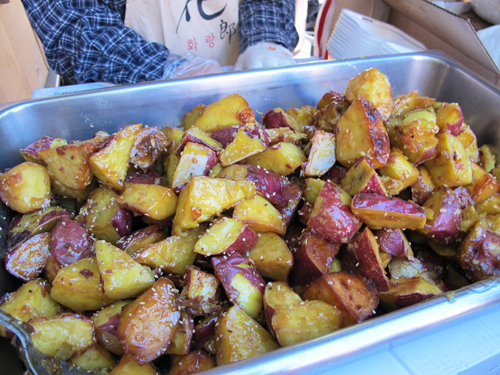 The honey-fried sweet potatoes looked wonderful too, but I dismissed them as too filling. The king spice rice cakes or duckboki looked familiar. I remembered them from a previous occasion. They were like fat solid noodles in an inviting red sauce. I didn’t mind the worm-like look, but again, too much starch. 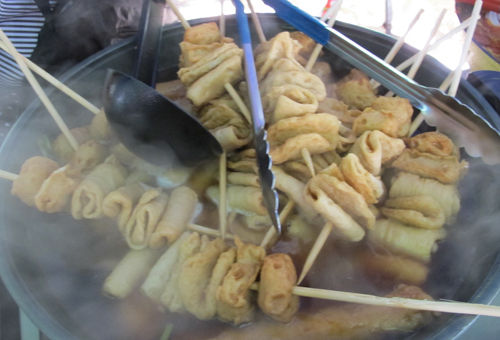 But the fish cakes on skewers looked artistic and yummy. They made me think of Tornado Potato skewers which were popular at the CNE. 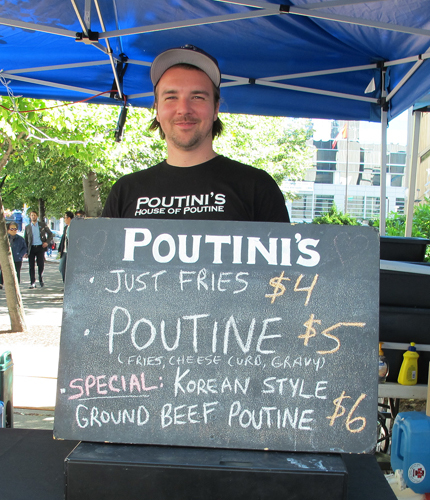 And then I saw Poutini’s House of Poutine Special – Korean Style Ground Beef Poutine. I looked up its website later but it didn’t list Korean poutine on its menu. I started wondering about food served at festivals. It seems that non-Korean vendors were being creative in what they were offering. New traditions do evolve out of the meeting of cultures. Maybe, some day, there will be a unique multicultural Toronto cuisine. Maybe it’s already here. The next day I was at the Ukrainian festival. One of the booths was offering a jerk-chicken perogie dumpling dish. It was the same thing. The cook at the booth had invented the recipe himself. He had first served it at the Taste of the Danforth. He boiled frozen chicken perogies and then added the sauce. He said he invented the sauce himself. This dish I did eat. 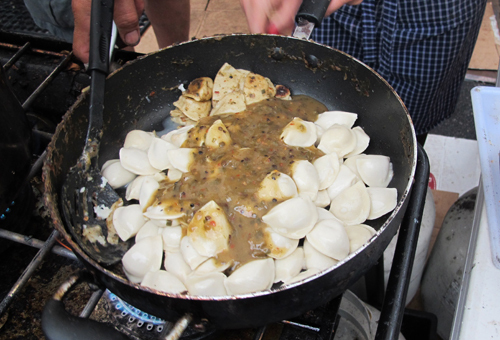 The sauce improved the usually bland taste of perogies. I like spicy. It was very good. Please let me know of your culinary adventures at Toronto’s festivals. I am delighted to read all the information about Korean food. We don’t hear much about it usually. Chinese cuisine is more famous.